Freeze Dried Camel's Milk Archives | Sahara Dairy Co.
ahara Dairy Co.’s Freeze Dried Camel’s Milk is gently processed to ensure all nutrients, health properties, taste and texture of authentic camel milk stay intact. Our 100% natural pasture raised camel milk has no additives, preservatives, antibiotics or added hormones. We work closely with our selected camel breeders so our final product is not only healthy, but safe. Opposed to spray drying, which is cost effective but destroys proteins and vital nutrients of camel’s milk, our Freeze Drying method is a slower no heat process that ensures all health properties of camel’s milk reach our customer. 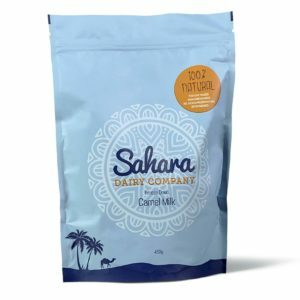 Sahara Dairy Co.’s camels are free to roam and forage on a large variety of nutritional dense local vegetation and herbs, which lends to a higher quality and more effective product.